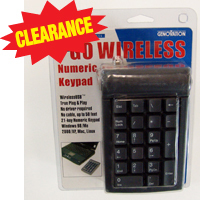 The Go Wireless Numeric Keypad from Genovation is designed for Windows based computers that have an available USB port. This wireless USB keypad is exclusively bound with the supplied dongle so that multiple keypads in the same area will not interfere with each other. Ideal when fast data input is required, such as in spreadsheet, accounting, and financial applications, this 21-key keypad uses frequency hopping 2.4 GHz spread spectrum wireless communication for high reliability and interference-free operation. Requires at least one available USB 1.1 port and is compatible with Windows 95/98/Me/2000/XP. AddPoint 17-Key Serial Port Keypad with built-in Touch Pad from Genovation is a combination keypad/touchpad for those who do lots of numeric data input with quick access to a mousing device. The 17 keys are assembled with high quality ALPS keyswitches and can be protected when not in use with the handy cover that comes with the keypad. The touchpad includes two tactile buttons. 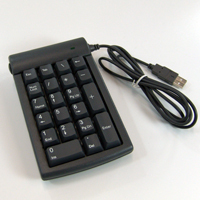 The keypad itself connects to a serial port (COM1 or COM2) and is programmable under Windows 95 or higher with these supported OSes: DOS, Windows 3.x, Windows 95 / 98 / Me, Windows NT / 2000 / XP. 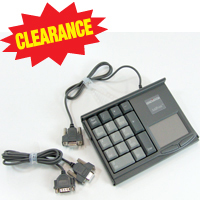 The Micropad 630 USB Numeric Keypad from Genovation is a 21-key numeric keypad that connects to any 1.0 to 2.0 USB port. It includes "Back-Space", "ESC", "TAB", and "\" keys and is compatible with MS Windows OSes supporting USB. 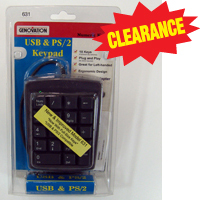 The USB & PS/2 Numeric Keypad from Genovation is a compact 18-key numeric keypad ideal for left- or right-handed use. It can be used plug-and-play and includes a USB-to-PS/2 adapter for those needing a PS/2 connection.